I love planning baby showers. There are so many creative décor themes and I love finding new DIY crafts to conquer. When I’m asked to host a baby shower, the first thing I like to do is ask the mommy-to-be if she has a certain vision for the shower. This is such a big day for the mommy-to-be and daddy-to-be, so I always want to make sure that it is what they want. If they don’t have something in mind, I will usually suggest three themes that I am envisioning and we will go from there. 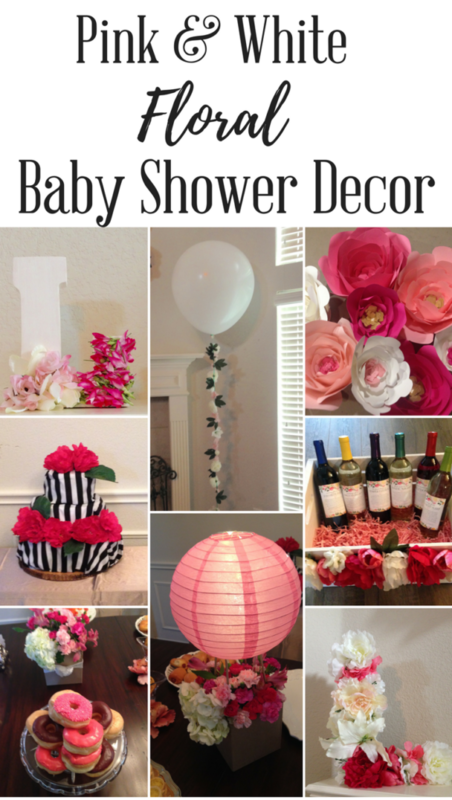 For today’s featured baby shower, the floral baby shower décor was not difficult to select. 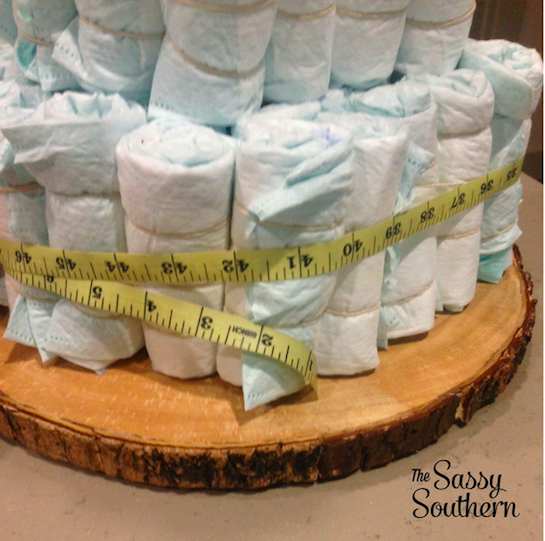 This sweet shower was for precious baby Lily. I talked with the mommy-to-be and asked what colors she was doing for the nursery. I wanted to make sure that she could incorporate any of the décor that she wanted to keep into the nursery. Since she was doing pinks and whites for the nursery, I used those colors for the majority of the décor. I had so much fun searching for the perfect invitation! 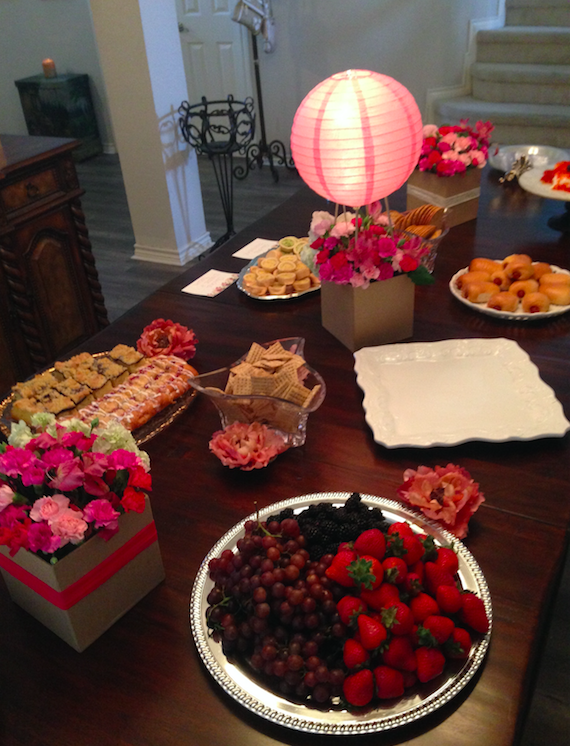 The invitation for a party sets the entire scene, so it is important to make sure it is absolutely stunning! 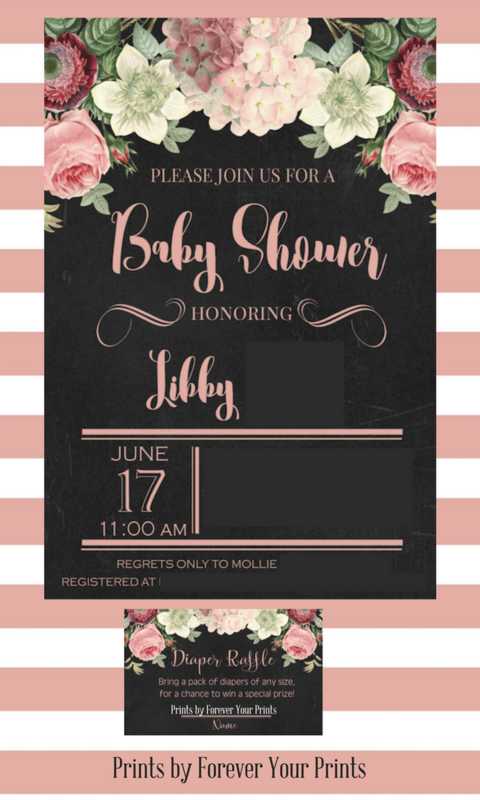 I found so many beautiful invitations on Etsy! I decided to narrow it down to three and let the mommy-to-be choose! She finally decided on this gorgeous design by Forever Your Prints on Etsy! I also love diaper raffles! When you order the invitations, make sure to also order diaper raffle cards! Include the diaper raffle card in the invitation. If guests would like to participate in the raffle, ask them to bring a pack of diapers to the shower and their name written on the raffle card. As they arrive, collect the diapers and drop all diaper raffle cards in a jar. During the game portion of the shower, draw a raffle winner and award them with a really fun prize! Just remember to make the prize extra special since the guests are bringing an additional gift! I love diaper raffles because guests don’t feel obligated to participate and it is a great way to collect a nice stash of diapers for the mommy and daddy-to-be! I also ordered thank you notes in the same design! I had a station at the party next to the guest book and I asked the guests to please fill out their address on an envelope. 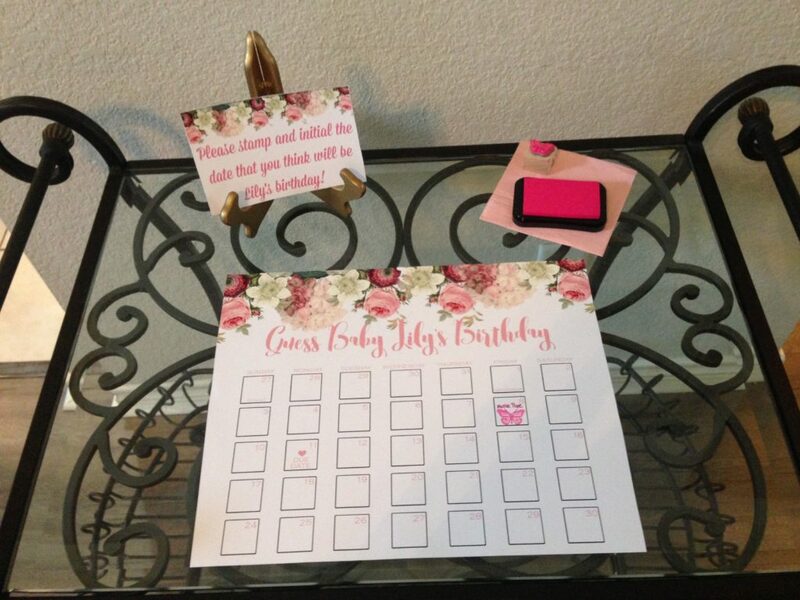 This saves the mommy and daddy-to-be a lot of time and makes thank you notes a breeze! Also, don’t forget to keep track of who gives what during presents! That list will be very helpful when it comes time to send thank you notes! This adorable shop also makes Guess The Date calendars! For those who are not familiar, a guess the date calendar is for guests to guess what date they think the baby will arrive! I purchased a butterfly stamp with pink ink and had all of the guests guess their date! I wanted everything to be covered in flowers with a show-stopping backdrop for the mommy-to-be to sit in front of during the shower activities. 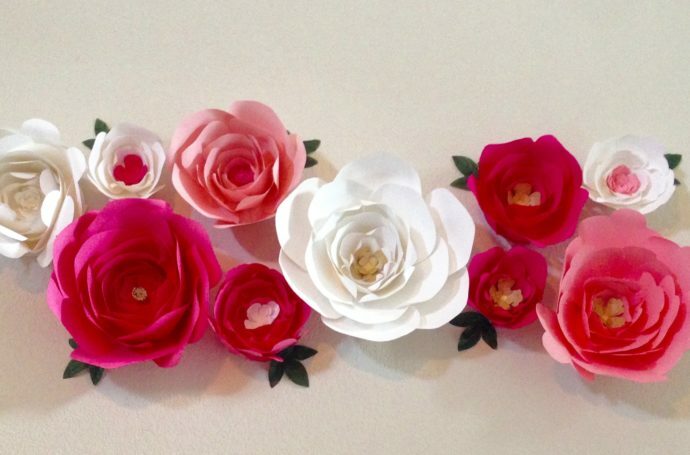 I found these beautiful paper flower templates on Etsy by Paper Flora. 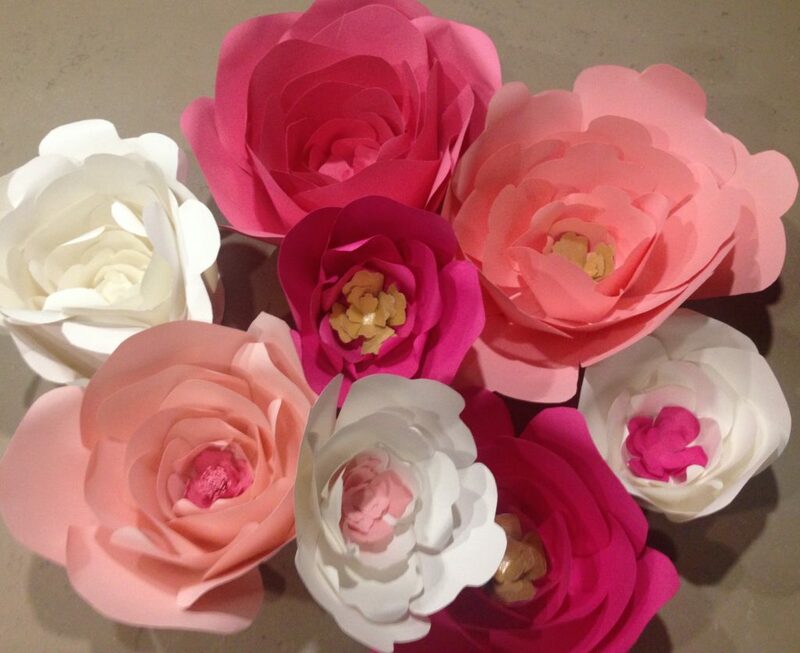 They are SO EASY to make and you can make multiple sizes from the same design. I chose my two favorite designs and purchased stock paper in the colors I wanted for the shower. I made multiple sizes so that I could create a floral arch on the wall and I used fake leaves that I had left over from a Tropical Themed Baby Shower that I hosted to add a pop of green to the flowers! 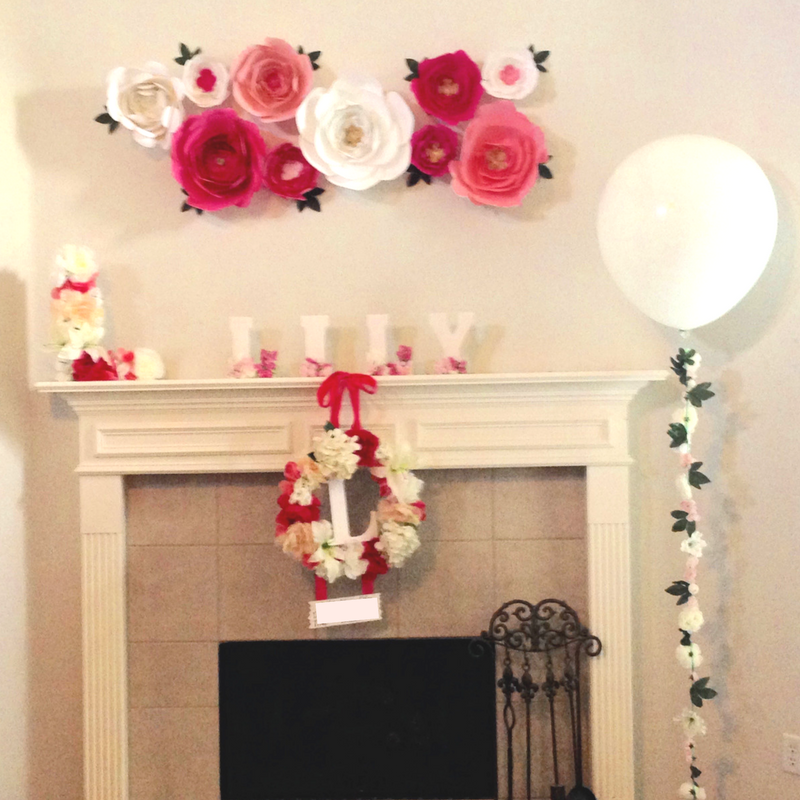 I purchased the Hangman Products PCR5 Poster & Craft Tape, 5′, Roll, White from Amazon to hold the flowers to the wall and it worked beautifully! This is the same tape I like to use when I make a balloon arch! I purchased these adorable wooden block letters from Hobby Lobby and painted them white. I then glued small fake flowers to the bottom and up the sides of the letters. 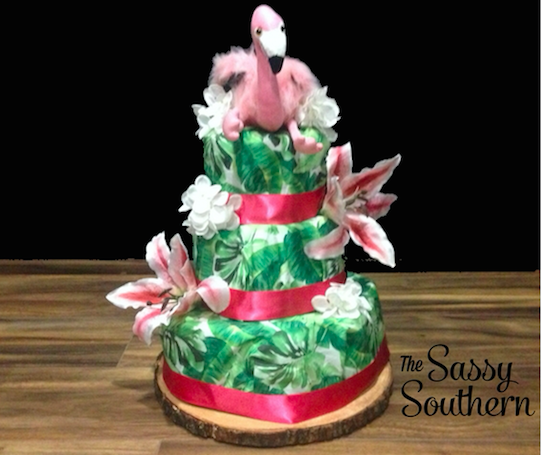 I LOVED how they turned out and so did the mommy-to-be! 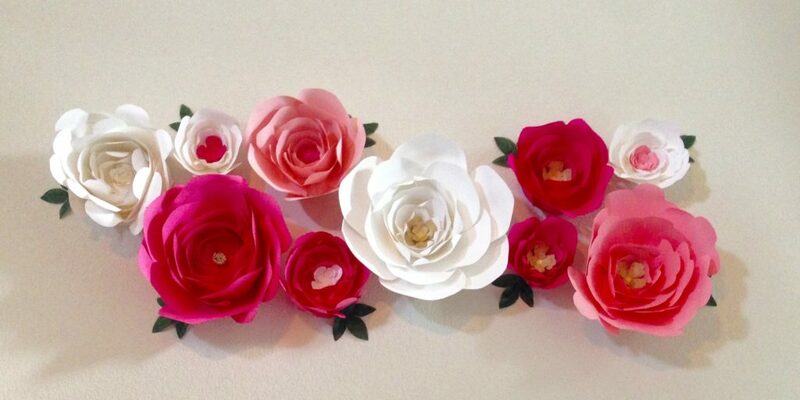 She has these in sweet baby Lily’s nursery now! I really love monograms and initials, so I purchased this giant cardboard L from Hobby Lobby and stuck fake flowers all over the L. I cut the flower off of the stem and just left a small part of the stem to stab into the cardboard. It worked perfectly and looked so pretty! I LOVE these gorgeous 36” balloons! They make such a statement when you walk in the room! 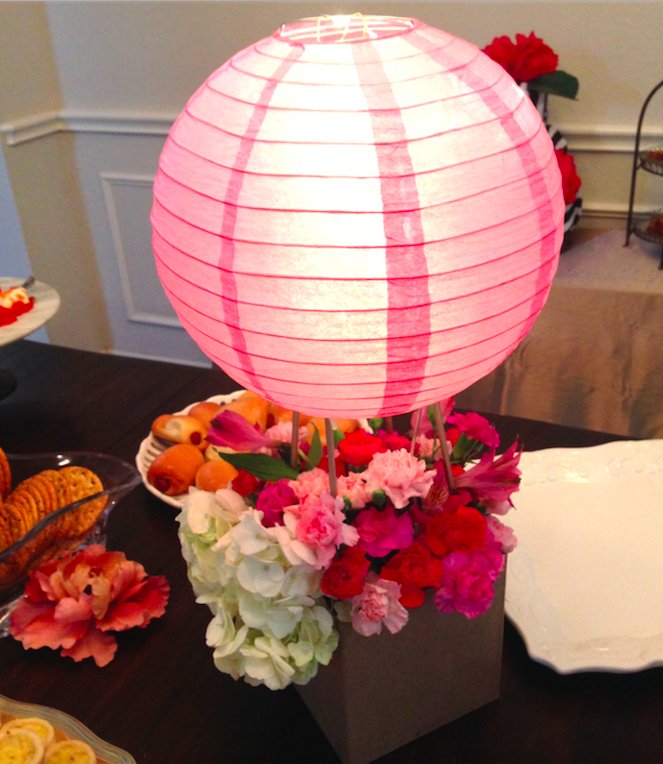 For this floral themed baby shower, I decided to add flowers to the balloon string to give it a little extra glam! I took small flowers and leaves and hot glued them down a balloon string. The morning of the shower, I tied the floral string around the balloon and cut the actual balloon string off of the balloon. It turned out so cute and the shower guests were asking where I bought it! Purchase your own pack of 36″ Balloons on Amazon! 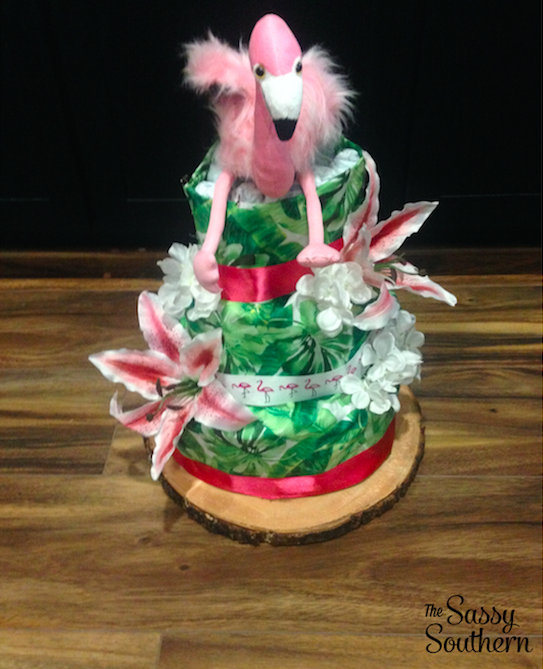 While diaper cakes don’t sound at all appealing, they make for fabulous baby shower décor and it is a great hidden gift for mom and dad! For this diaper cake, I decided to go with a black and white striped fabric and then use giant pink peonies to make it pop! 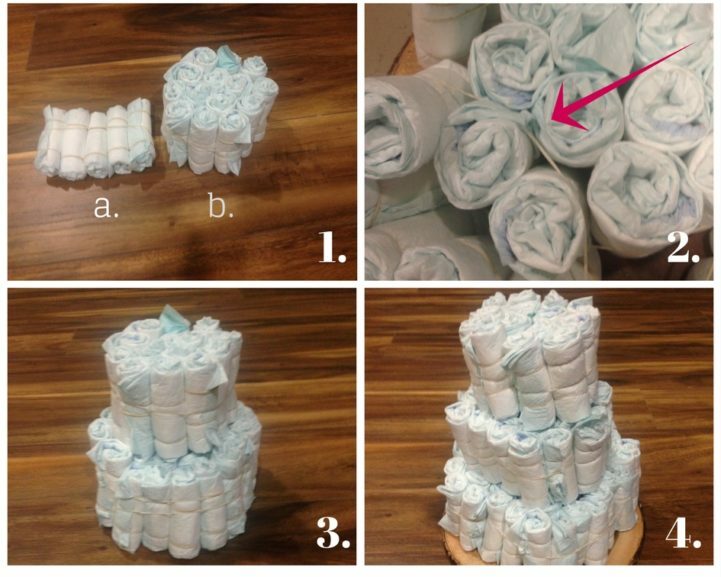 Check out my blog on how to make a diaper cake here! I always love to include this with my gift! While all of the gifts are to the mom and dad, they are really for baby! 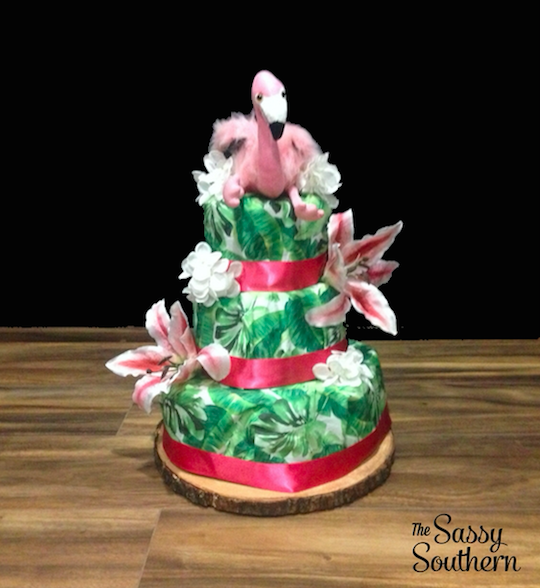 This is a creative and fun gift that mom and dad can enjoy together to celebrate after the baby is born! I found these adorable Mommy Milestone custom wine labels on Etsy by Lush Label! 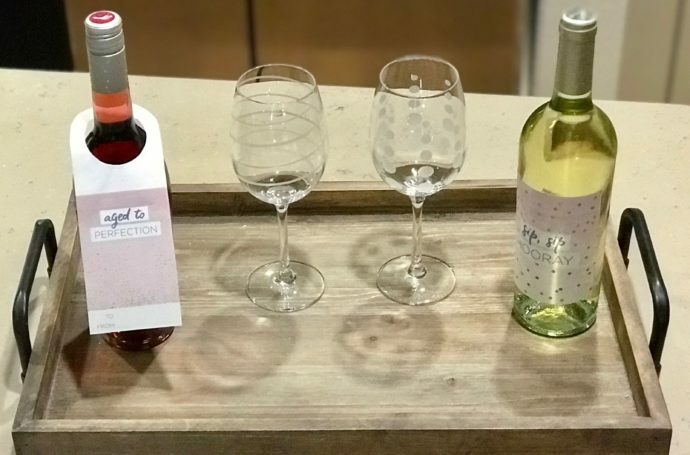 Each wine label celebrates a different occasion after baby is born and includes a cute poem! You can have the babies name on the bottom to make it extra special! 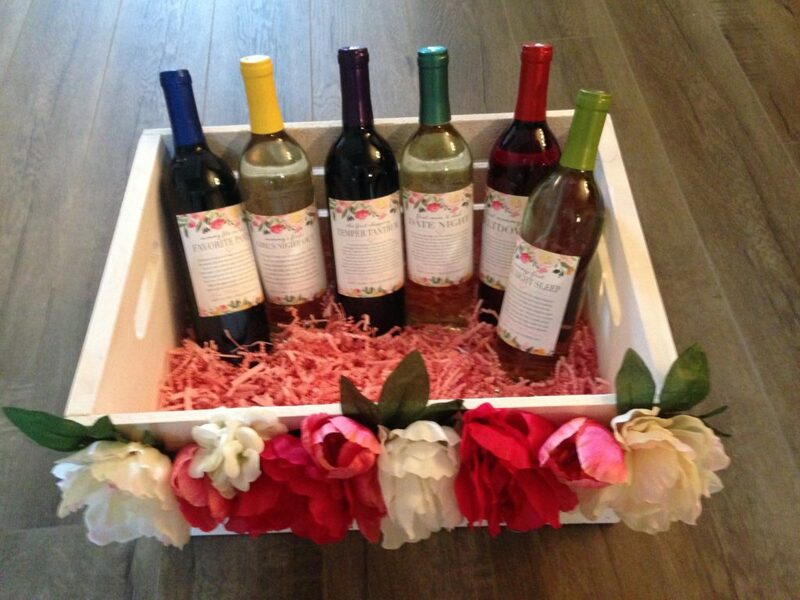 Check out my blog post on how to make a mommy milestone wine basket here! Help mom and dad welcome baby into the world with a beautiful hospital door hanger! 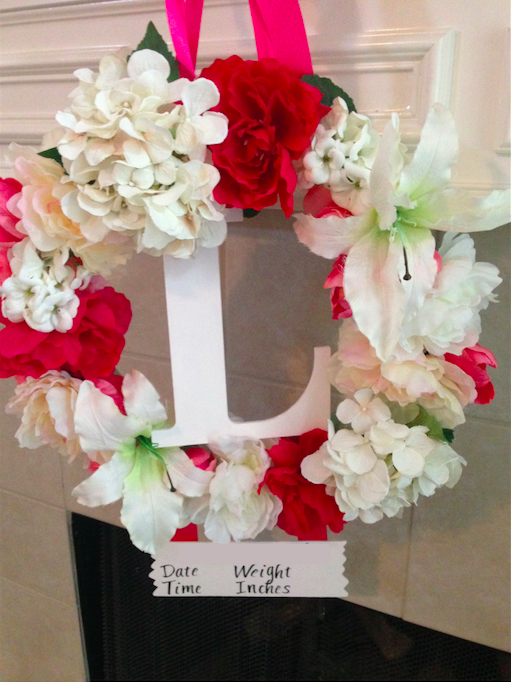 This is a great way to show off sweet baby’s name and their official birthday as the loved ones visit the hospital! This also looks amazing at the shower! Check out my blog post on how to make a hospital door hanger! 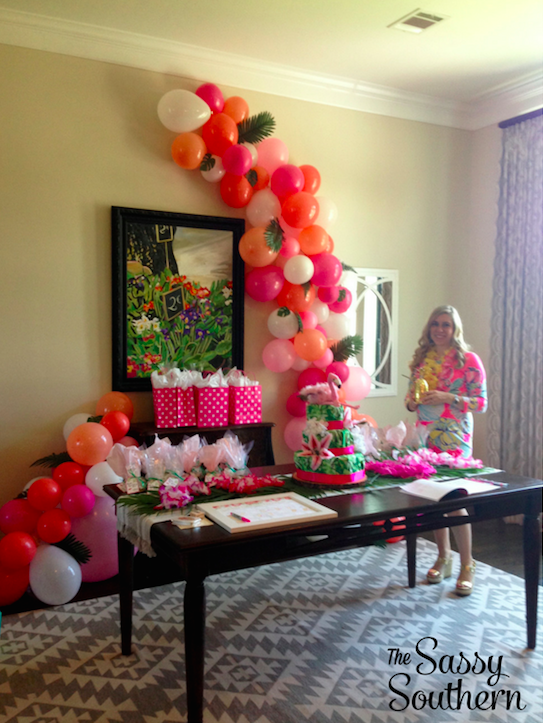 Special moments like a baby shower go by so quickly! I always like to include a guest book for mom and dad to look over and remember their sweet friends and family who showered them with love and support. Instead of a blank book that may end up stuffed on a shelf, I like to buy a favorite children’s book for the guests to sign and leave sweet messages. Each time mom and dad read this to sweet baby, they are reminded of the love and support from their friends and family! As baby gets older, they will be able to read the sweet messages of love and support and know how much they were loved before they were even born! 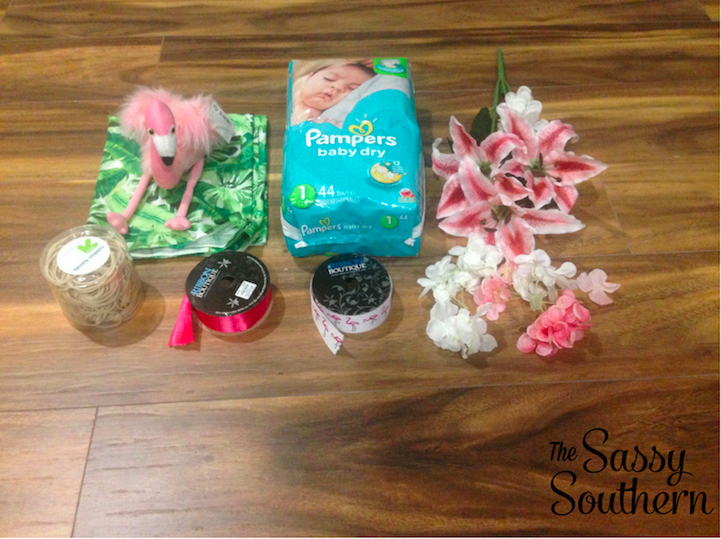 I love playing baby shower games where my game supplies can also act as a gift for the mommy and daddy-to-be! The Price Is Right is SO much fun and mom and dad end up with a lot of necessary items for baby! I pick out 10 necessity items listed on their registry for the game. I give each guest a piece of paper with each item numbered. I introduce each item to the guests reading them all of the necessary information. For example, if one of the items were a baby bottle cleaning brush, I would include that this particular brush is BPA free, has a suction cup base and a flexible neck for easy cleaning. Each guest would then write down their estimated guess of the price of that item. Once I go through each item, each guests adds up the total of all items and the guest with the closest estimated total to the actual total of all 10 items wins! Mom and dad take home all of the items for the game and the guest leaves with a fun prize! Target gift cards are always a popular prize! For this shower I went with a brunch theme. We had a donut cake, fruit tray, veggie tray cheese, crackers, coffee cake, quiche, Danish, and pigs in a blanket! For the beverage station, I had a coffee bar, juice bar, hot tea, iced tea, and water. 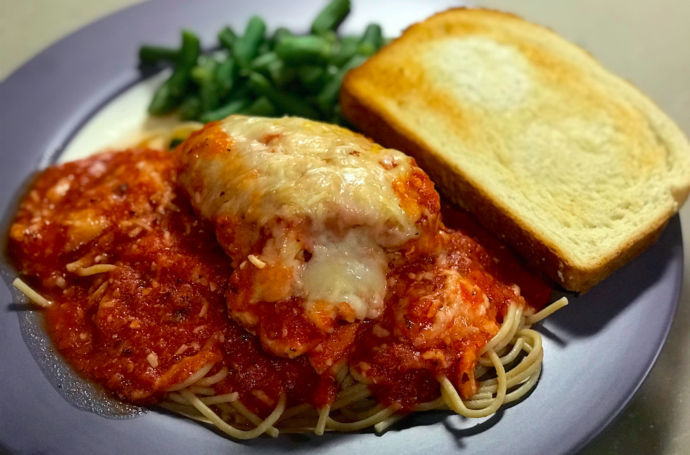 There were very few leftovers! 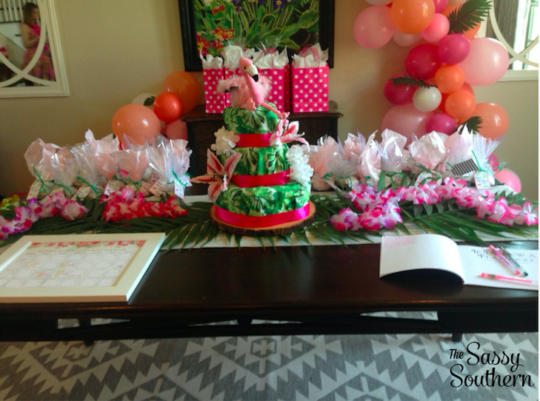 If you are still trying to select the perfect theme for you shower, check out my tropical themed baby shower décor ideas! When I started planning the overall design for a tropical themed baby shower I was co-hosting, I really wanted a big focal point that guests saw the second they walked through the door. 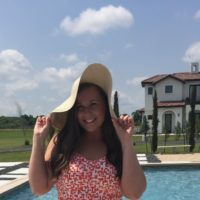 As I was searching Pinterest for inspiration, as we all do at some point during the day, I saw a pin from 100 Layer Cake-Let! 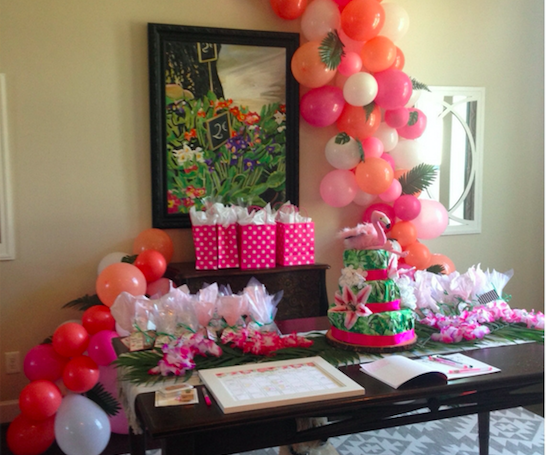 They shared a balloon arch that they created for a flamingo themed birthday party. I was instantly obsessed. I saw that they used a balloon arch tutorial from The House That Lars Built. I watched the tutorial twice and felt that I could totally make this happen. I showed it to my husband and let him know that I need him to be my engineer for this project. Being the sweetest husband in the world, he jumped on board. Hangman Products PCR5 Poster & Craft Tape, 5′, Roll, White – We bought this from Amazon for just $7.16. It is amazing! This was all that we used to stick the balloons and the balloon strip to the wall. Not only did it stay up for the shower, it stayed up for 7 DAYS and didn’t take any paint off of the wall! I also have more than half of the roll left to use on my next project. Glue Dots Craft Roll, Contains 200 ( .5 Inch) Adhesive Craft Dots – We bought these from Amazon as on add-on to my larger order. However, you can find these at Walmart. We paid $3.60 for this as an Amazon add-on. These came in handy for sticking the smaller balloons on top of the larger balloons. We also used these to stick help the plants stay on the balloons. Balloon Arch Decorating Strip 50ft – I honestly don’t know how we would have done this without the balloon arch decorating strip! It is extremely easy to work with and made designing the shape and final design extremely easy. 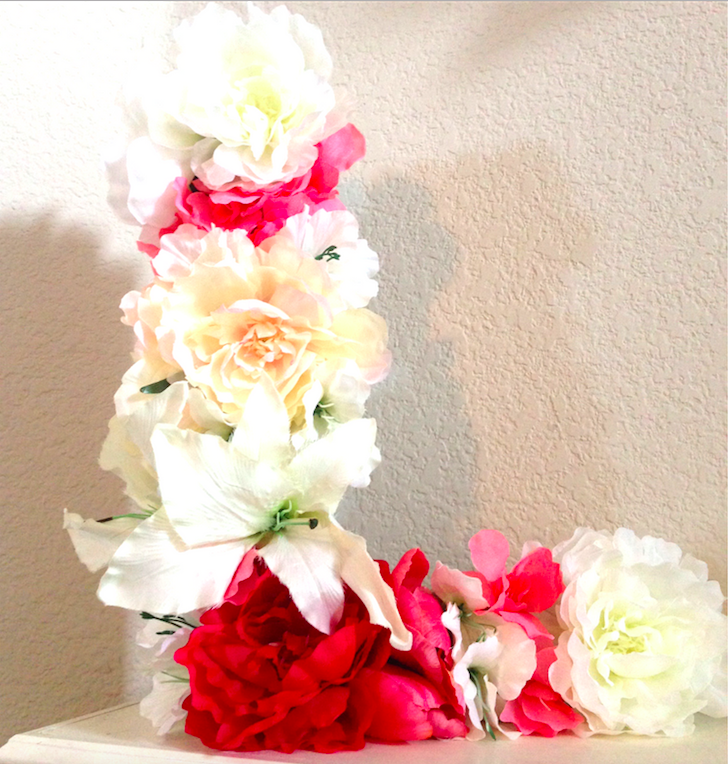 We purchased from Party City for $9.99 and have a lot left over for our next project! Balloons – I wanted very specific colors, so I ordered most of my balloons from Amazon. However, I did buy white and pink balloons from Hobby Lobby. 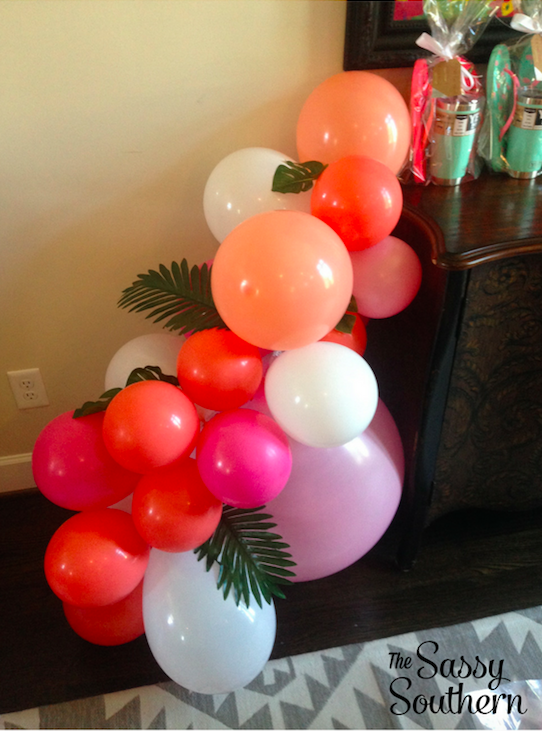 I purchased the coral and peach colored balloons from Amazon. 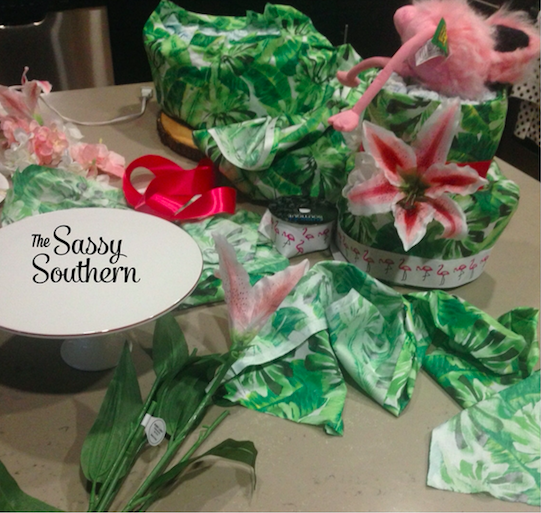 Silk Palm Leaves – I purchased the silk palm leaves from Oriental Trading Company and I bought the smaller tropical leaves in a bunch at Hobby Lobby. Remember, they put their floral 50% off every other week! 36” Giant Latex Balloons in Pink & White – I LOVE the giant 36” balloons but they are so expensive! I found a pack of 10 for only $13.99 on Amazon! I didn’t need 20 36” balloons for this baby shower, but I knew I would use them for future parties and events. I used one of these at the bottom of the arch on each side to have a nice base. Electric Balloon Pump – Knowing that he would have the very special job of blowing up the balloons, my husband requested this particular piece of equipment and it was BEYOND worth it. We bought it for $24.99 at Party City. He was able to inflate 100 balloons in 40 minutes. He could still breath and his hands weren’t even tired. This was a fantastic investment. Learn how to make your own balloon arch from The House That Lars Built here! 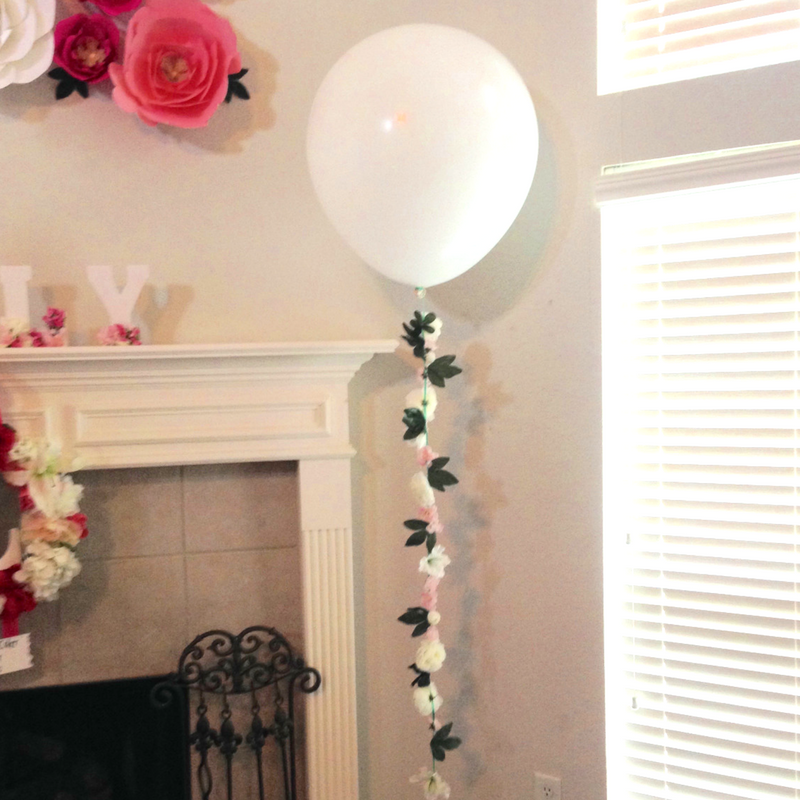 This balloon arch was a huge hit at the baby shower and really tied the whole room together! It took us 3 hours and 10 minutes to inflate the balloons and put up the arch. We spent around $70 on supplies and we still have 18 of the 36” balloons, the electric balloon pump, balloon arch decorating strip, AND the craft tape and glue dots left over. These will come in handy for the next balloon arch!